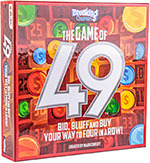 To sell “The Game of 49” in your store, please contact sales@breakinggames.com. Contact Kathy Kwon, kathyekwon@gmail.com, (310) 435-0812. If you own the first edition of “The Game of 49” and need CUSTOMER SERVICE (replacement parts, etc. ), please e-mail info@markeegames.com.